Sometimes, context is everything. For example, finding out you're skilled at a game is normally considered to be good news, and If I'd been at home playing Call of Duty 4's multiplayer, I'd have been outright pleased. But instead, I learned that I was good at the game at two in the morning, sitting at a friend's computer, on the night the woman I had been with for ten years told me that our marriage wasn't working anymore. My relationship with my parents is such that they weren't my first point of call, so I went to a friend's house instead and ended up blasting kids with usernames like 'xXx_PsychoKilla_xXx' with a modified AK47 in some unnamed town in an unspecified Middle Eastern country. It was a weird place to find solace, but playing the game meant that I had to focus my attention on something other than my broken heart. It was just random chance that my friend had been playing Modern Warfare that night, but after nothing but raw hurt for hours and hours, I needed to stop thinking for a little while. Modern Warfare allowed me to do that. 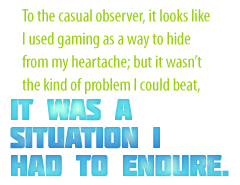 I suppose to the casual observer, it looks like I used gaming as a way to hide from my heartache; but it wasn't the kind of problem I could beat, it was a situation I had to endure, and gaming let me do that. While the split with my wife was undeniably the very best thing that could have happened to me, getting to the point where I could see that properly certainly didn't happen overnight. It was the first time in my entire adult life that I'd been single, and that concept took a long time to get used to. It's never easy to lose someone, especially when it comes as such as surprise. I was completely caught off guard. That very morning, she'd gone off to work as normal, without the faintest hint of what she was thinking. We hadn't been arguing, like you might imagine, although I had noticed that something was bothering her. With the gift of hindsight, it's pretty obvious that the best days of our marriage were behind us, but there, in the moment, as she was ending things, I was completely blindsided.